Dreamy Mushrise Park is the Dream World's version of Mushrise Park and a location in Mario & Luigi: Dream Team. It is the second location visited in the Dream World. 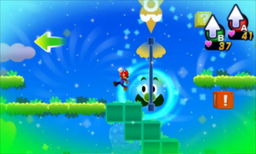 Mario comes here to free Eldream in order to gain access to Dream's Deep. However, it is discovered that a rabbit named Dreambunny has Eldream's Nightmare Chunk, and the Bros. give chase. Along the way, they encounter a dreamy version of Brickle who also wants to catch the bunny in order for his theme park to gain popularity. They eventually catch Dreambunny and free Eldream, who opens a portal to Dream's Deep as a reward for saving him. This is also the location where the Bros. learn the Luiginary Ball. This area is also entered when Luigi sleeps on the Pink Pi'illo outside Neo Bowser Castle.